Lampang (Thai ลำปาง) is ane o the northren provinces (changwat) o Thailand. 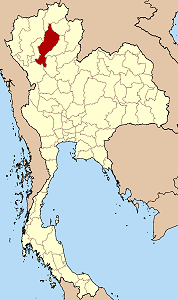 Neighborin provinces are (frae north clockwise) Chiang Rai, Phayao, Phrae, Sukhothai, Tak, Lamphun an Chiang Mai. The auld name o Lampang is Khelang Nakhon. Wikimedia Commons haes media relatit tae Lampang Province. This page wis last eeditit on 12 Mey 2013, at 18:56.